On the 15th August 2015 I flew out of Brisbane for my journey to the other side of the world. First stop was Singapore. After a nine-hour flight, I only had a few hours transit so it was pretty much taken up with finding out that the butterfly garden was closed because it was night-time; really wishing I had decided to shell out for a pod hotel room for a few hours; discovering that the only real air conned room was the movie theatre so sat to watch a Chinese film for about 45 minutes before trekking to my gate. Another ridiculously long flight and I arrived at London Heathrow airport (fun fact: I have flown into Heathrow 4 times by only flown out of it once). Then was the next step of getting the Piccadilly Tube line to Kings Cross Station for my Virgin East Coast train to Edinburgh. Even though I was pretty knackered from flying across the world, I couldn’t stop looking out the window at the scenery & towns going past. I definitely added a few places to my England Bucket List that’s for sure! I finally arrived in Edinburgh about 30 plus hours after leaving Brisbane, and I was rather tired. I arrived at Waverley Station in the middle of Edinburgh and got a cab to my accommodation near the West End of town where I was meeting my travel companion. But not before getting a glimpse of my first bagpiper. And the ultimate Edinburgh experience – the Royal Edinburgh Military Tattoo (I can’t explain how long I had waited to see this in person!). Fun Fact: This event has been on my bucket list since I was a little kid. I have always loved bagpipes.. Overall I liked Edinburgh a lot. There was so much more history there than I ever could have imagined. 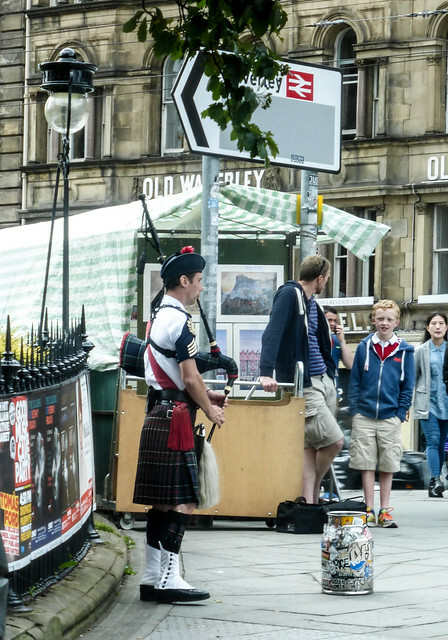 I would like to go back when the Edinburgh Fringe isn’t on and the population hasn’t risen from around 400,000 to over 1 million but at the same time, it was quite something to experience when there was so much going on. Next up on the Travelversary journey.. the road trip from Edinburgh to London… stay tuned.